Thinking about giving an Easter lily to someone for the holiday? It makes sense to gift this flower, since the white, trumpet-shaped blooms represent purity, newness, and virtue – the same characteristics that come to mind when many think about Easter. To give you a little background on the Easter lily, so that you can know more about the gift you might be giving and so you can perhaps share some lily tradition with your giftee the following are a few myths, legends, and bits of trivia associated with the flower. Roman mythology links lilies to Juno, the queen of the gods. The Roman tales say that Juno’s excess milk fell from the sky while she was nursing her son Hercules and it was turned into lilies. Many believe that lilies were found growing in the Garden of Gethsemane after the death of Christ. Believers follow tradition that tells of white lilies springing up where Christ’s sweat fell to the ground. Churches continue the memory of Christ by placing Easter lilies all over their altars, and surrounding their crosses, leading up to Easter Sunday. They do this to commemorate the resurrection of Jesus and to show hope for everlasting life. The Easter lily has long been connected with the Virgin Mary. Early paintings show Angel Gabriel extending a branch of pure white lilies to the Virgin Mother acknowledging that she is the mother of the Christ Child. 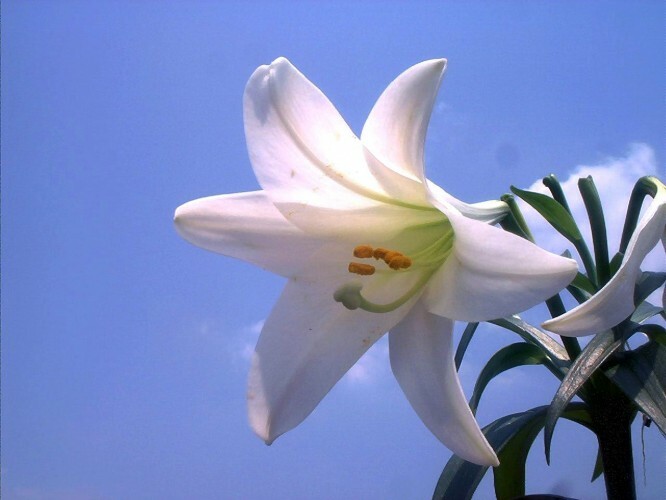 A symbol of grace, the white lily has meanings beyond Easter. It adorns homes as well as churches, and it marks joy, purity, and an innocent approach toward life. This flower is truly one for happy celebration and rejoice. During the Victorian era, the stamens and pistils of the Easter lily were removed because they were seen as overt representations of sexuality that might lead some to have impure thoughts. Have you heard of any other tales or myths surrounding the Easter lily? If so, feel free to share them with us in the comments below. We’d love to read your stories and have other members of our flower community be able to enjoy them. Thinking about giving an Easter lily to someone for the holiday? It makes sense to gift this flower, since the white, trumpet-shaped blooms represent purity, newness, and virtue – the same characteristics that come to mind when many think about Easter.To give you a little background on the Easter lily, so that you can know more about the gift you might be giving and so you can perhaps share some lily tradition with your giftee the following are a few myths, legends, and bits of trivia associated with the flower.